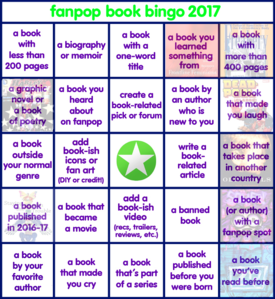 How does Fanpop Book Bingo work? You simply mark boxes as you complete them. (Just read a book with a one-word title? Cross it out or color it in!) You can do this with any image editing program. (Microsoft Paint, anyone?) I recommend saving yourself a copy of the card to update, which you can find link. Ye Olde Fanpop Star is the free space. 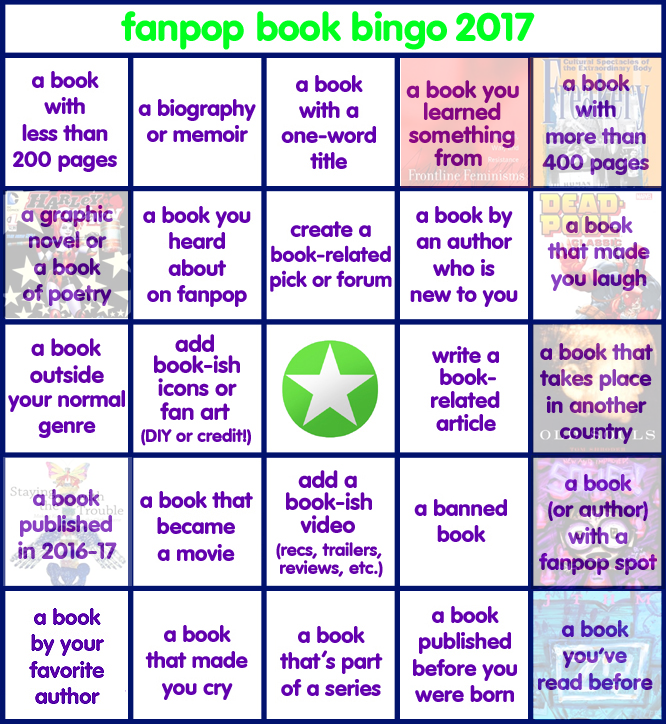 You can add your updated card here in the forum each time you finish a book or task, or wait 'til you get Bingo and add it. 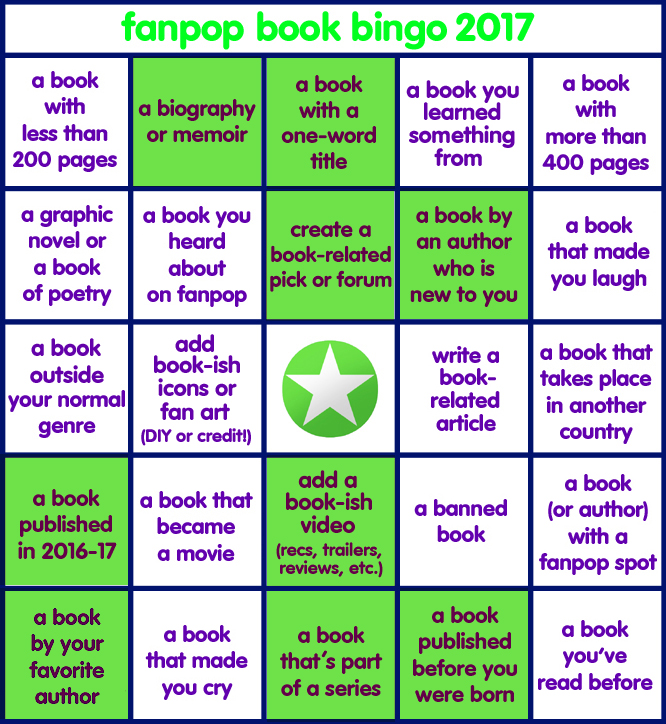 You don't have to review them, but include the names of the books that got you there! -5 boxes in a row, including diagonally, and lines completed with the help of the free space. -5 unconnected boxes. The free space will not count if you go the random route. -Those too easy for you? Complete the card! The satisfaction of knowing you are a cooler person for having read five books. No? 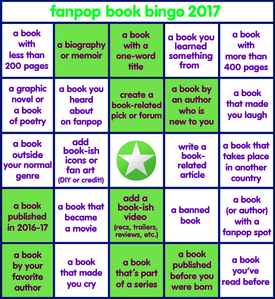 The satisfaction of knowing that other fanpoppers think you are cooler for having read five books? Okay, fine. You'll get a prop. Happy now? To read more books. To read different books. To connect with other fanpoppers. To have fun. To add stuff that makes the spot more interesting and active. 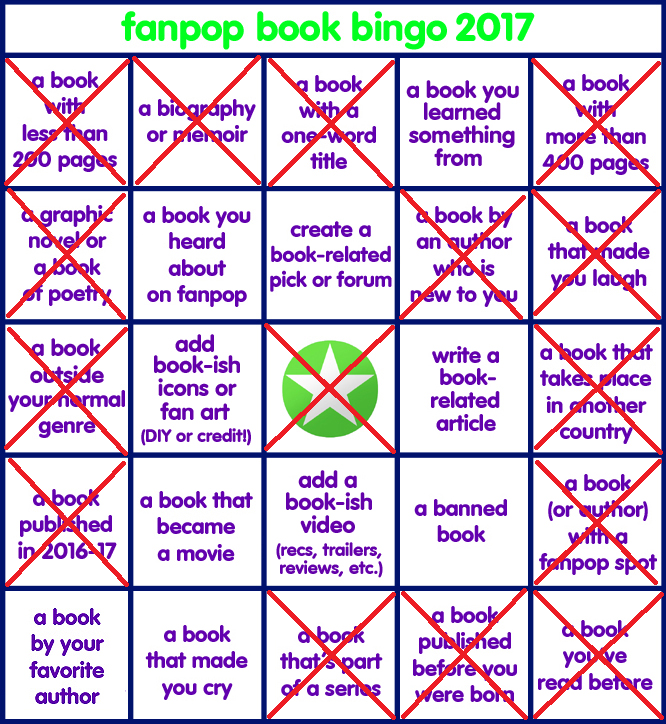 How is this different from the incredibly successful Fanpop Book Bingo of link? It's been re-arranged and updated to say 2017. 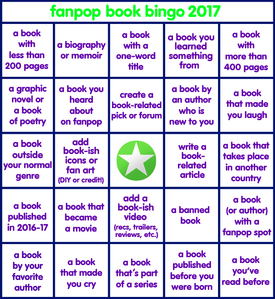 The book-ish fanpop content (picks, forums, videos, articles) counts for any spot, not just this one. I ditched the best-seller box, 'cause who cares. It's been replaced with "a book you learned something from". 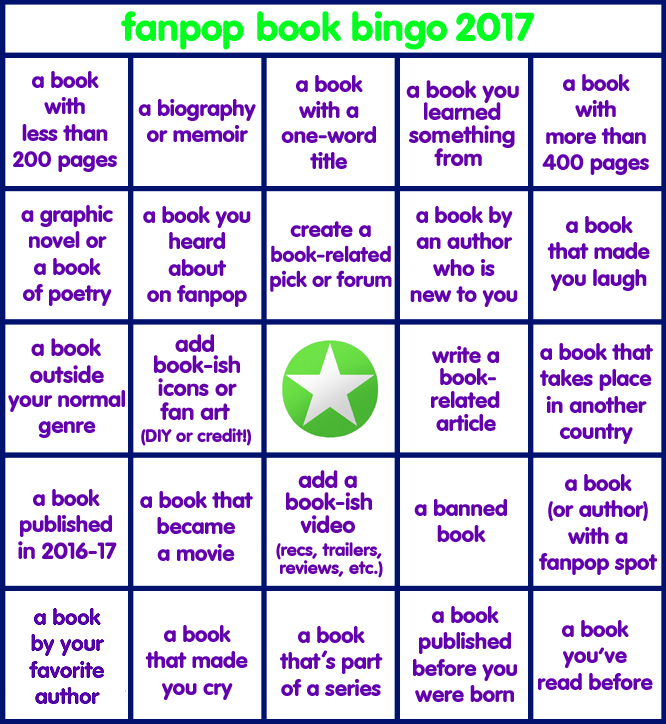 Behold, a shiny new Fanpop Book Bingo 2017 card! Aw snap I got one already. Look y'all, it's totally achievable this time! Book forum: This one, link. DANG ok imma keep track of this years one I promise. 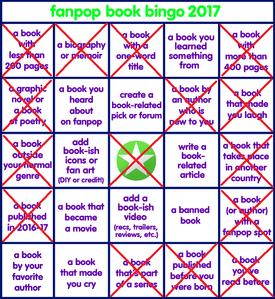 - Part of a Series; Spirit Walker, Undercurrent, Execution, Last Sacrifice, Entice, Scorch Trials, 2 Lighthouse Lane books, and 2 Royal Diaries books.